The Predator 21 X is the world's first notebook to offer a curved 21-inch IPS display (2560 x 1080), and when combined with wide-angle viewing, it delivers a truly immersive gaming experience. To bring gameplay immersion to the next level, the notebook also integrates Tobii eye-tracking technology for a new method of control that's more intuitive and natural. Built-in eye-tracking hardware (infrared sensors and software) unlocks a completely new facet in gaming. By tracking a gamer's eye with software, the notebook introduces new interactions like aiming, identifying enemies and taking cover simply by gazing at objects on the screen. Eye tracking also enhances the experience by providing infinite views whilst navigating treacherous paths and roads in a game. With 7th Generation Intel Core processors and dual NVIDIA GeForce GTX 1080 graphic cards in SLI, the Predator 21 X takes the AAA gaming experience to new heights. The curved screen also features NVIDIA G-SYNC technology to ensure smooth and sharp gameplay in every scenario. The Predator 21 X also ships with SoundPound 4.2+ (4 speakers and 2 subwoofers), 3-way audio and Dolby Audio for truly pristine aural enjoyment. 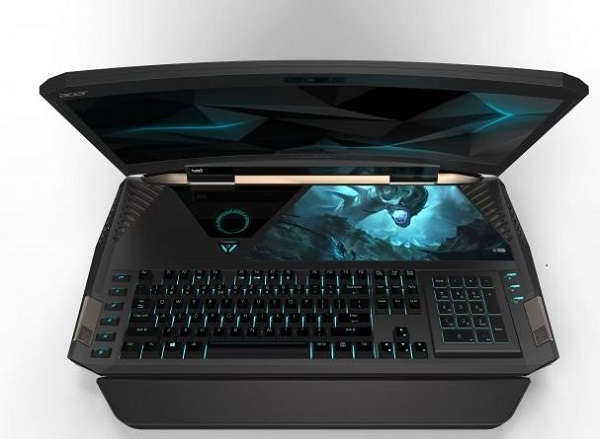 The notebook also features an advanced cooling architecture with 5 system fans, 3 of which are ultra-thin AeroBlade metal fans, to dissipate excess heat effectively for uninterrupted performance during intense gaming sessions.